The University of North Carolina Board of Governors on Aug. 23 said an outside firm would be retained to investigate how university and local police responded to the toppling of the Confederate Silent Sam statue on the UNC-Chapel Hill campus. 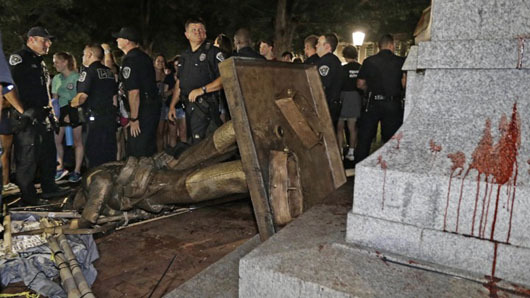 A mob of some 250 protesters toppled the statue on Aug. 20. The statue was installed on the campus in 1913. Blacklisted News on Aug. 23 posted a video which shows campus police standing down just before the mob used ropes to topple the statue. NC state Rep. Bob Steinburg, in a telephone interview with the Raleigh News & Observer, said he was appalled at law enforcement officers standing back, “even smiling” as protesters took down Silent Sam. “Whoever was on that security detail that allowed this to take place and are seen in this video and can be identified … need to lose their jobs. Whoever gave the directive to stand down, then these folks need to be fired,” Steinburg said. Smith told the Carolina Journal that the UNC’s governing body will support UNC-Chapel Hill Chancellor Carol Folt and will work with the school’s Board of Trustees to handle the issue “in full transparency.” Smith said he’s had many discussions with Folt about the situation. “It’s a difficult landscape she’s in,” he said. UNC board member Marty Kotis said that university leaders need to set boundaries and rules to prevent lawless behavior. “It’s like a toddler. If you don’t set the rules, the toddler will run amok,” Kotis said.